The race begins and ends at Fromagé & Other Fine Foods • 31 Earl Street • Clayton, GA – just East of Main Street! 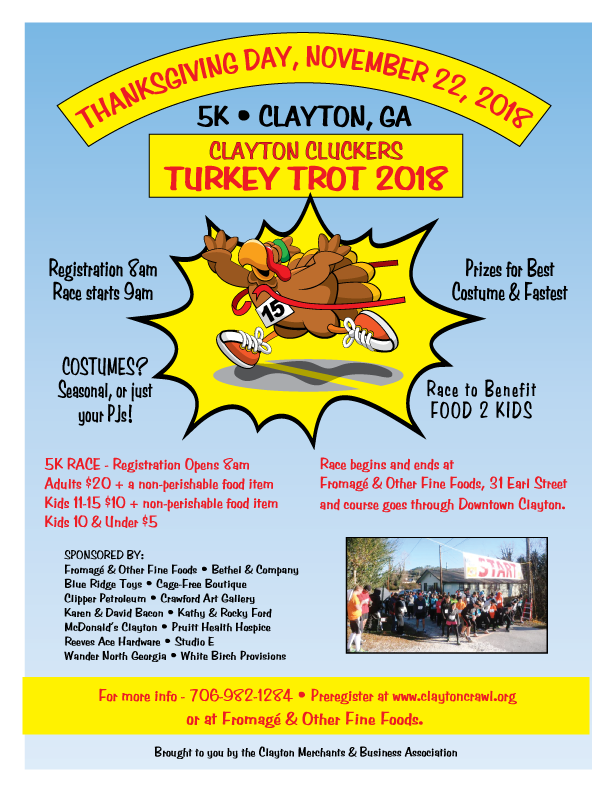 Thanksgiving morning throw the turkey in the oven and bring the whole gang to run or walk in the Turkey Trot! Money raised benefits the Food 2 Kids program at the Food Bank of Northeast Georgia. Prizes are awarded for fasted times in various age categories and best costumes. Kids and adults are urged to dress up in Thanksgiving or holiday costumes to add some fun to the race. Prizes will be awarded! This event will be fun for the whole family and a great way to start off Thanksgiving Day!! !